Another long, cruel winter is mercifully and slowly crawling to an end. My region had the coldest February on record from what I’ve been told, with an average high temperature of only 24 degrees F. And though spring is just around the corner, it still hasn’t sprung yet. I’ve vowed to never again start any woodworking projects in the dead of Winter, and this year I stuck to it. The problem with that vow is that it left a minimum 3 month time frame where I didn’t make any furniture. So what have I been up to, then? 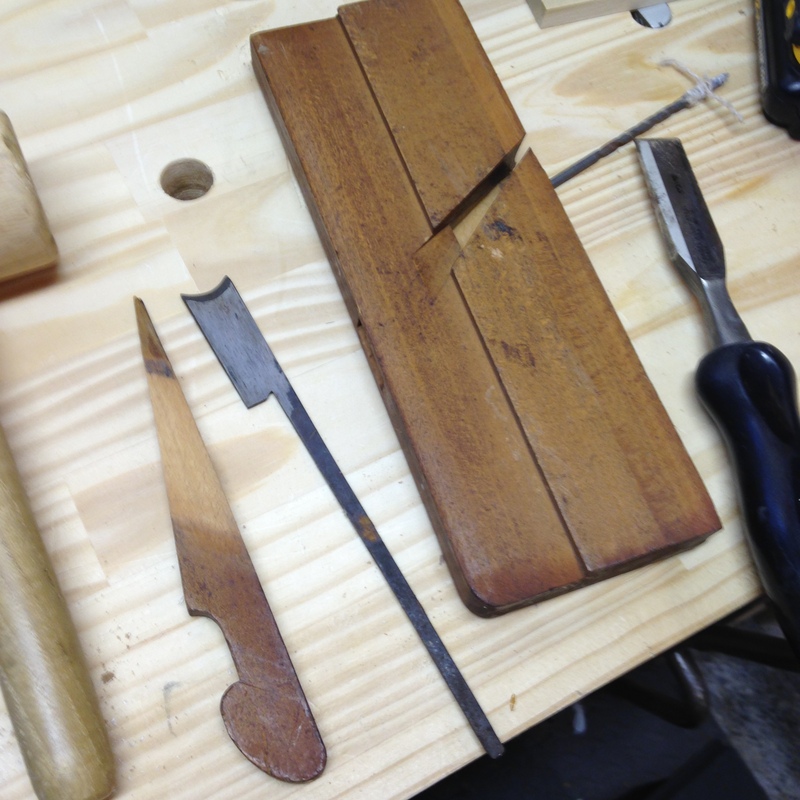 Well, besides insulting people who read this blog, I’ve been taking care of my tools. Last week I picked up my first set of hollow and round planes. 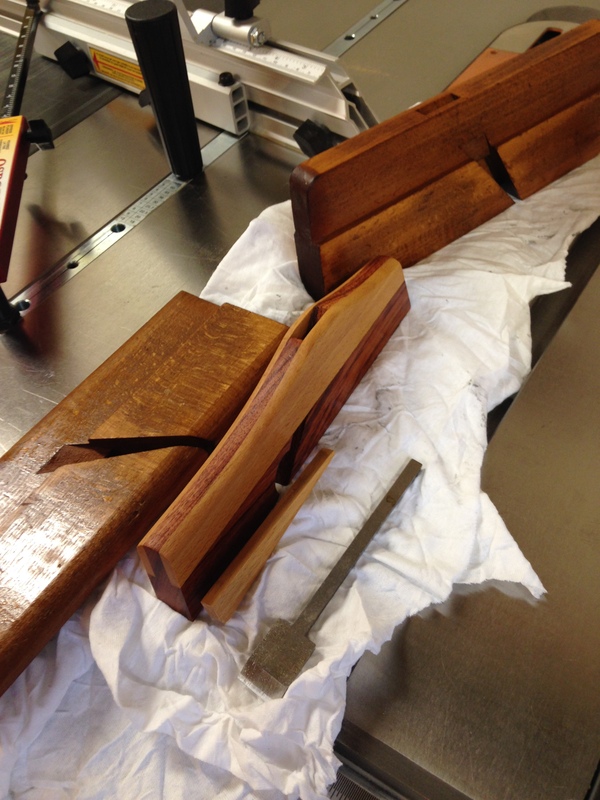 The planes are matching, meaning that they are from the same maker, and they arrived in pretty good condition. The irons were a little rough, in particular the round iron. But before I got to work on the irons I started on the plane bodies. Because the plane soles are obviously profiled, I needed a way to flatten them other than the bed of my table saw. So yesterday afternoon I stopped at Lowe’s, which apparently is the IKEA of home centers, and picked out the straightest 5/8 inch oak dowel I could find. 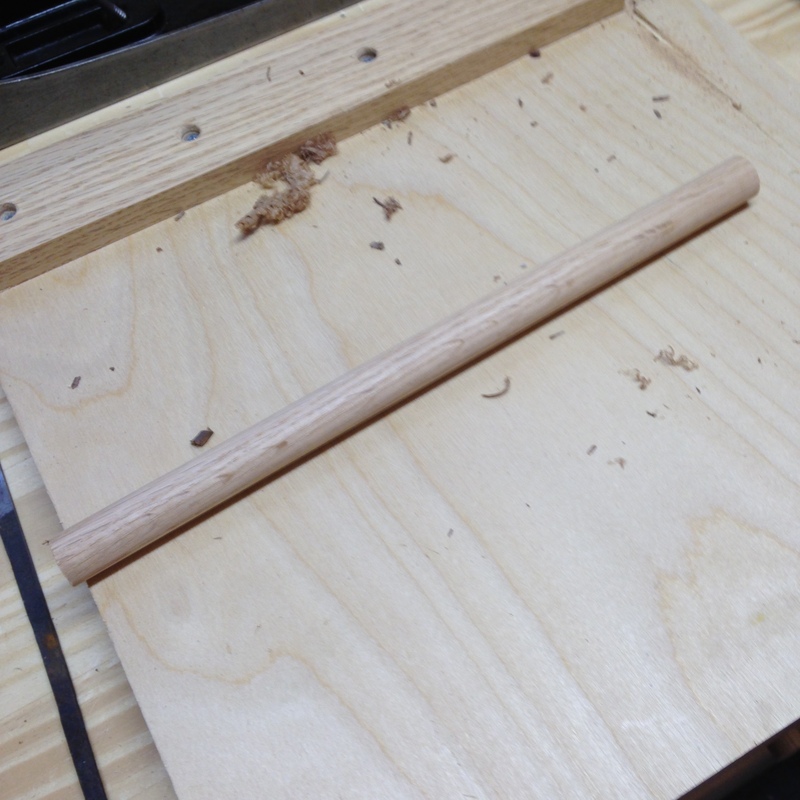 I sawed off a foot long piece from the dowel, wrapped a piece of 220 grit sandpaper around it, and used it to clean up the hollow plane. Once that was done, I used the hollow plane and sand paper to clean up the round sole, which was luckily in pretty good shape to begin with. Once that was finished I turned to the irons. As I said before, the irons on both planes were in pretty rough shape, especially the round. 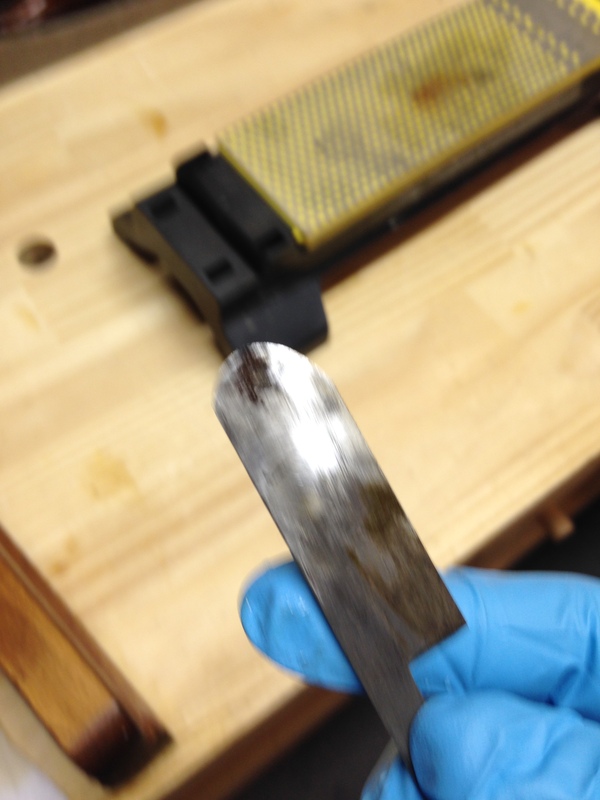 My sharpening method was the same as nearly every other ancient plane iron I’ve ever sharpened: coarse diasharp, fine diasharp, 1000 grit water stone, 8000 grit water stone. Flattening the bottom on the round took 15 minutes, and my arms were actually sore afterwards. The hollow was thankfully much easier to flatten. I then used the dowel/sandpaper once again to sharpen the hollow plane, using 220/400/600 grits, then the 4000 grit slipstone. I also plan on stropping it, I just didn’t have the time today to do it. As far as the round, I plan on dedicating next Saturday to taking care of the bevel. now that the back is flat I will be able to concentrate fully on it. On a side note, I’m not sure who the previous owner of this set of planes happened to be, but whoever that person was he didn’t know how to sharpen. I’m not an expert sharpener, I’m not even all that great, I’m good enough to get a sharp edge. I don’t know any magic tricks, but I do believe that the woodworkers of yesteryear sharpened a lot less than we believe they did, and I don’t think there was much science to it. I think they brought their irons to a grinding wheel and sharpened willy nilly just so they could get back to work. I can understand why they did it, but I’m not so happy about it. As far as the bodies of the planes were concerned, I lightly sanded down any rough spots, then saturated them in linseed oil. 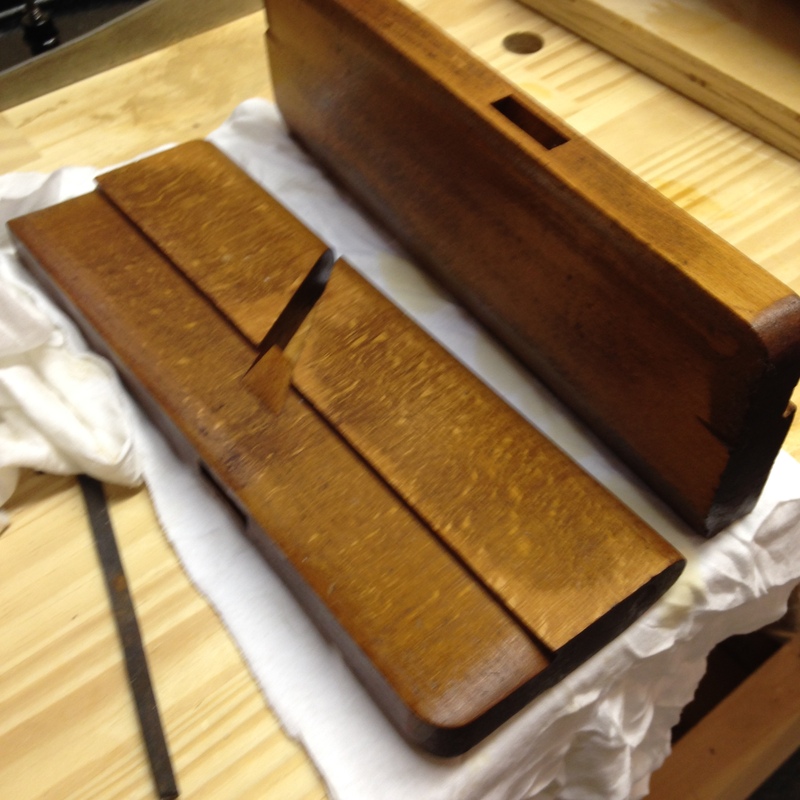 As with my other moulding planes, I poured the oil down into the throat of the plane, let it soak for a few minutes, and then cleaned up the excess. Whether or not this is considered proper plane maintenance I cannot say, but it so far hasn’t caused any issues, and the planes all look much better after the fact. There were two other maintenance tasks I wanted to complete before the end of the weekend. 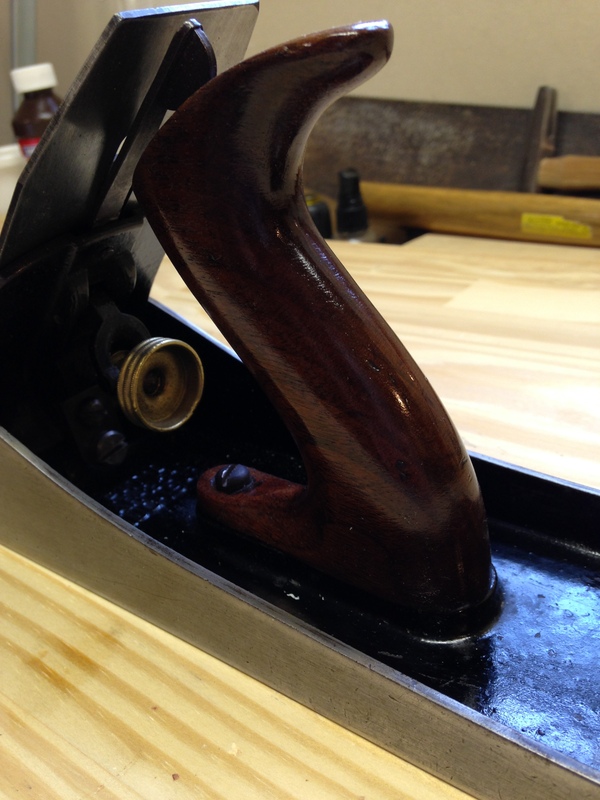 The first was to oil the tote and knob on my jointer plane. That actually started earlier in the week. Each night after work I coated the knob and tote with Tru-Oil, lightly buffing between coats with steel wool. Last night I added the 5th and last coat. I also took the plane apart, gave it a cleaning, and sharpened the iron. With the plane looking new I used it to clean up the top of my workbench, which was starting to look pretty ratty. It worked brilliantly, and as always the #7 is a pleasure to use. 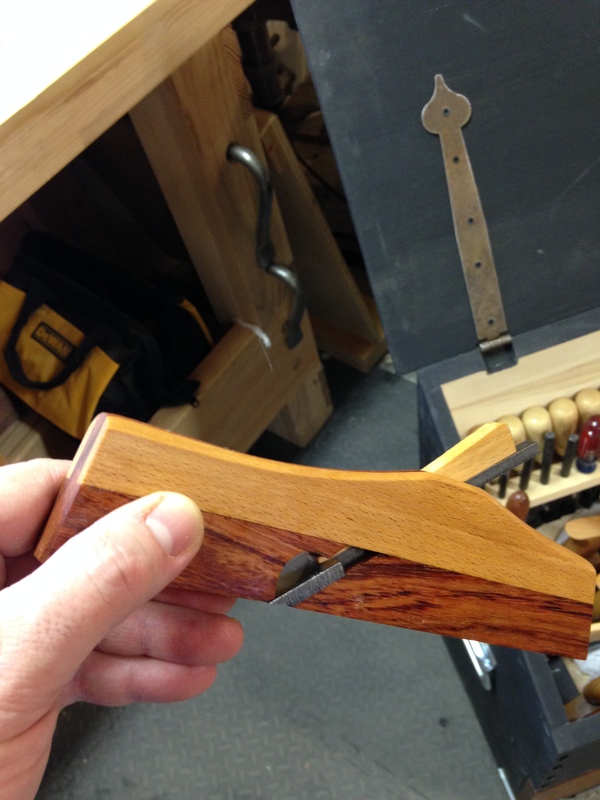 Lastly, a while back I made a shoulder plane from a kit purchased from Hock Tools. Admittedly I don’t used the plane often, but I was never satisfied with the shape, so I decided to do something about it. I drew an outline on the plane side and roughed it out with a coping saw. 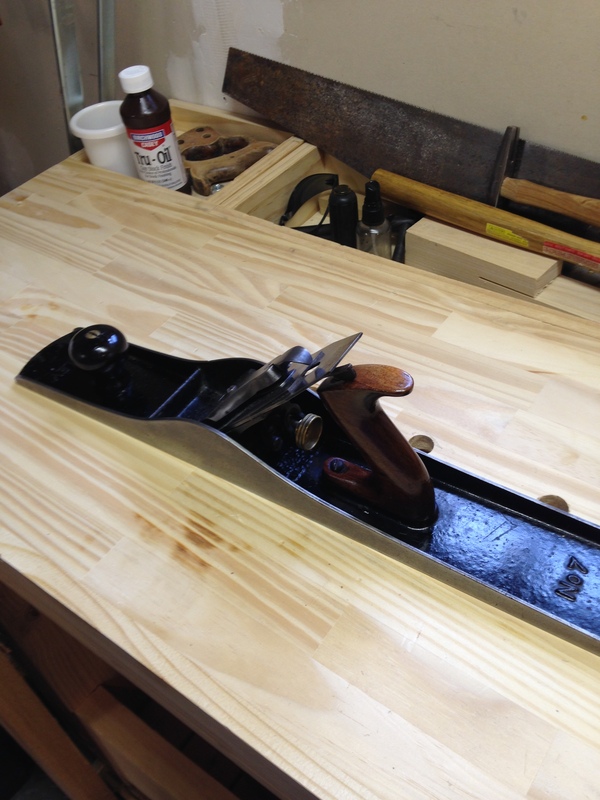 I then used a spokeshave to clean it up, followed by sandpaper to smooth it out. 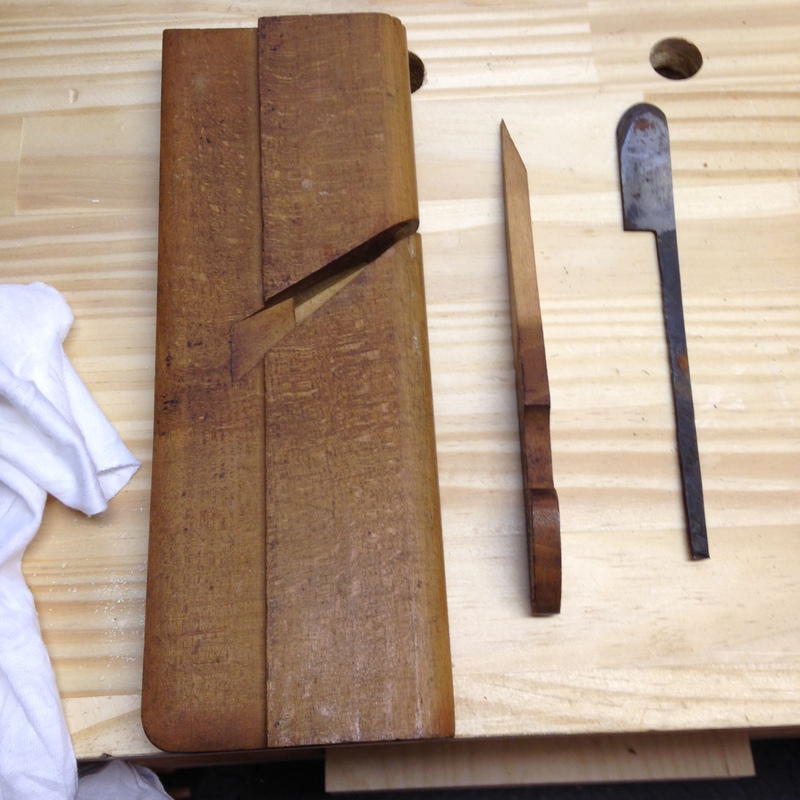 I flattened the sole (making sure to keep the iron and wedge set), and then gave the plane a few coats of linseed oil. As it was drying I honed the iron, afterwards taking it for a test drive. The plane performed well, and while it is hardly spectacular looking it no longer looks awful. After I cleaned up, and before I called it a day, I gave all three planes another light coat of linseed oil and set them on the side to dry. I’m happy that I got the hollow plane in working order, now I just have to get the round up and running. Most importantly, I have to start making furniture again. By billlattpa in moulding planes, tool refurbishing, woodworking, Woodworking Tools on March 15, 2015 . The planes are looking great. You are just about locked and loaded for when the weather finally breaks. There are just a handful of tools that I would still like to pick up. Even so, I have everything I need. The other tools would just be luxuries. I too think woodworkers were less OCD about sharpening in the past. they could get away with it. Maybe it’s just been my experiences with old tools, but I don’t think they sharpened until they absolutely had no choice. I would bet that there were some guys who sharpened religiously, but I think the everyday guy in the shop was just too busy to do otherwise. And you’re right, straight grained cherry, walnut, pine, and ash are pretty forgiving with tools that might not be razor sharp. Planes look good! Noticed the till that you made a year or so again, how wide did you make it and would you change the dimensions? The interior of the till is just under 24″ wide, and I would definitely make it wider. I wanted it to be wide enough to fit my jointer plane. The problem was that when I laid out the chest I had taken apart the jointer plane to clean it and completely forgot to use it to mark the length of the boards. So it barely fits inside the till. So if I made another it would be at least 27 inches wide. The front compartment I made deeper than the plans in PW magazine. I wanted it to be deep enough to hold long files etc. The bottom compartment is about 6 inches deep(or wide depending how you look at it). 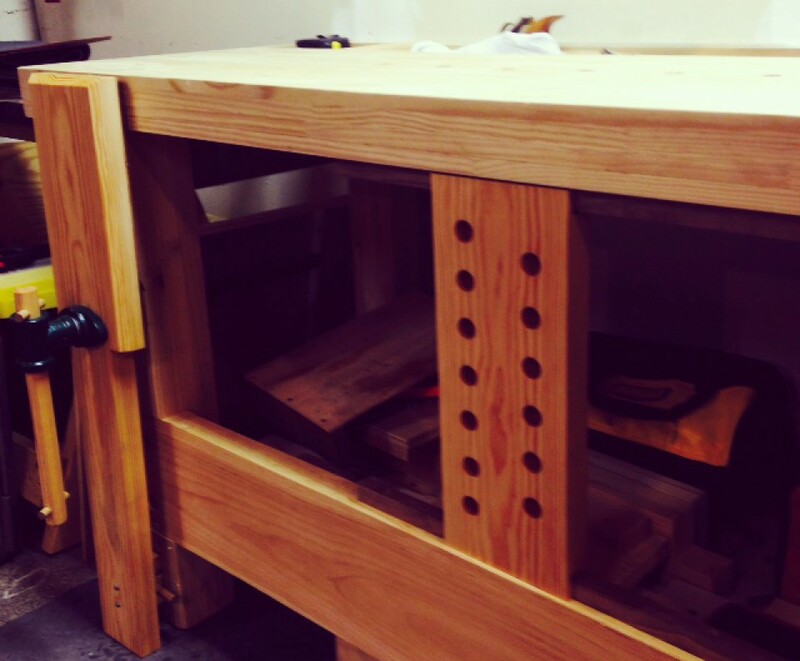 Overall, the chest is roughly 25 inches wide, 25 inches tall, and about 13 inches deep. I’ve thought about making a new one, but the way my garage is laid out I would rather make a wall cabinet. I’ve wondered about how people used to sharpen, compared to what we do now. Today, we quite literally turn to science, benefit from research done that includes examining our blades under microscopes, seek out the best mediums available world wide to do our sharpening with, & etc. No way were the options we have today available to someone in the 19th Century, or even most of the 20th. I suspect what we’d consider a cheap oil stone today was par excellence for people 100 years ago. Point: willy nilly quick sharpening and back to work. However, then I consider the incredible difference a blade that is truly sharp can make when faced with a difficult piece or challenging operation. It has certainly always been understood that a truly sharp blade can overcome challenges and make the work much simpler. I haven’t looked it up, but stropping I’d guess has been done for eons. Razor sharp isn’t a modern invention. Access to the science we have today wasn’t available in the past, but I’d be surprised if skilled people didn’t have methods they followed to make an edge as sharp as humanly possible. Something to do when the daylight runs out. I’m just guessing, but I believe that the average, everyday journeyman woodworker in a shop sharpened only when absolutely necessary, and that being just a quick grind and back to work. I don’t think they were being lazy, I think they just didn’t have the time to do it properly. I can’t imagine the shop owners of the day taking kindly to his employees spending an hour or more each day sharpening. 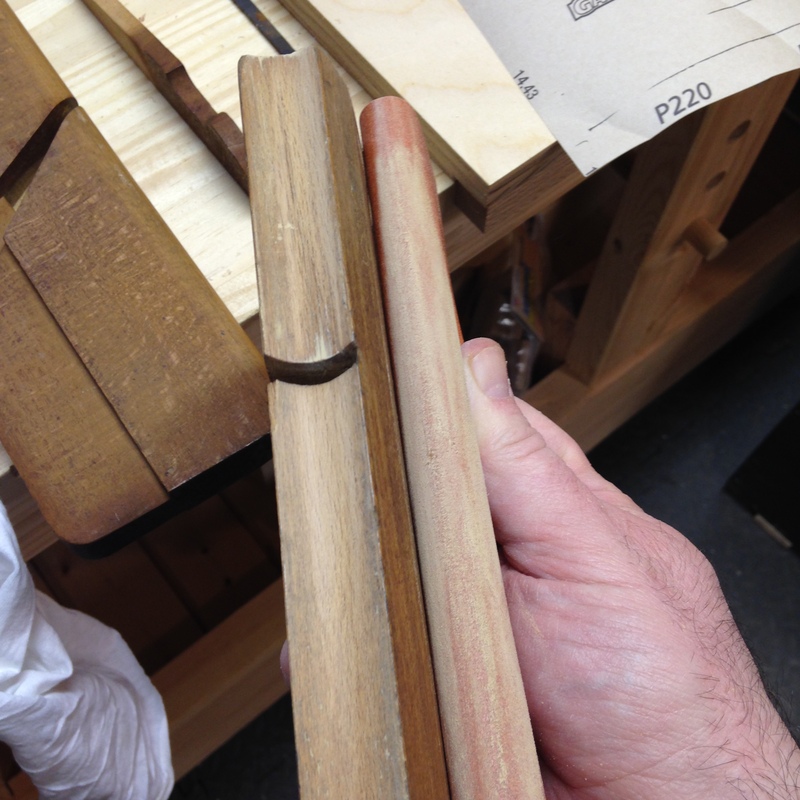 Could you imagine the amount of time it would take to sharpen an entire set of moulding planes every day? Yet, it is recommended that we do just that. We work under the mantra of “sharpen your tools before or after each use”. I highly doubt that these guys did that, they just didn’t have the time to do it. And now that I’ve seen a small but respectable amount of old tools, I at least have something to back up my theory, because most of the tools I’ve seen were roughly sharpened. 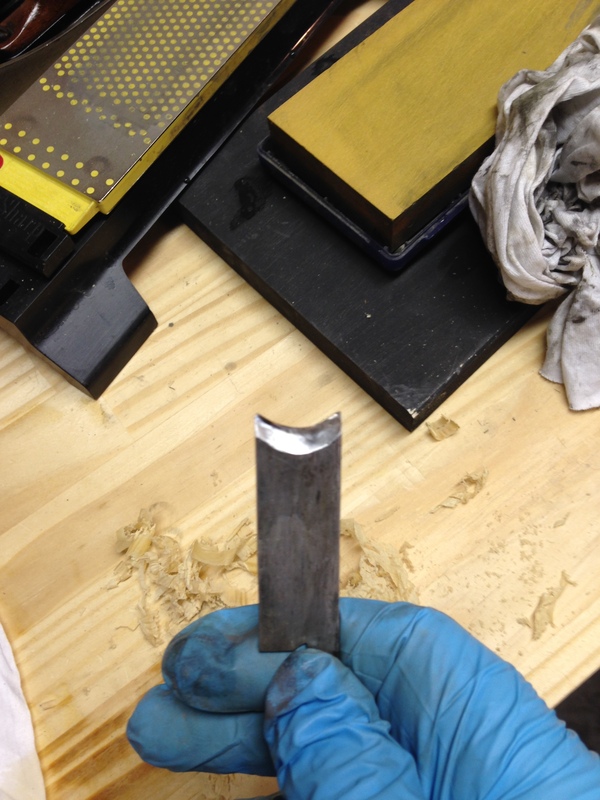 They likely didn’t have water stones machined flat, or premade sharpening jigs. They did what they had to do to keep working. I can respect that. While I don’t agree with some of your assumptions and conjecture… its your blog and I will leave it at that. One thing you might find interesting and informative if you have not seen this already is Matt Bickford’s blog. This stuff predates the book and DVD, but there is quite a bit of good information. The link below he discusses sharpening, and there are videos where in real time he sharpens a new set of hollows and rounds. I’ve checked out his blog before and found it very interesting. My only complaint would be that he doesn’t seem to post very often, but I’m sure he is pretty busy. I really enjoyed hus book, and while I haven’t seen his video, I’m sure he makes it look easy. I will check it out when I get the chance. Thanks very much for the link.